Thigh bone of a 9 foot man found in Mound. Braden, Okla., Aug. 25 (/P). Indian relica estimated to be from 600 to 2,000 years old and including the thigh bone of a giant brave are being taken in large numbers from a huge burial mound 4 1/2 miles southwest of here. 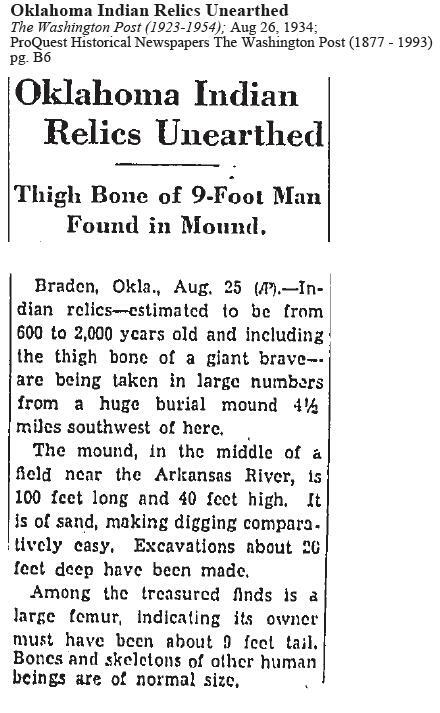 The mound, in the middle of a field near the Arkansas River, is 100 feet long and 40 feet high. It is of sand making digging comparatively easy, Excavations about 20 feet deep have been made. Among the treasured finds is a large femur, indicating its owner must have been about 9 feet tall. Bones and skeletons of other human beings are of normal size. READ Who are The Watchers?